Common men doing uncommon things. Cars racing closer than you park in the parking lot, in turns steeper than the roof of your house. These are all descriptive phrases that are accurate. The Daytona 500 is the largest race on the NASCAR calendar. The event rivals the Indianapolis 500’s title as the biggest race in the world. Motorsports are always fighting for attention from the mainstream media. Other sports sometimes overshadow stock car racing for national headlines. But for one day a year, auto racing does not challenge others as the day’s top sports story. Auto racing is the biggest story and all the other headlines must challenge the 500 for attention. Thrilling finishes – like these five – have helped make the Daytona 500 what it is today. 1. 1979. This race was the perfect storm. Circumstances lined up to make this a historic race. CBS was airing the race live flag-to-flag for the first time ever. A snowstorm blanketed much of the East Coast, keeping people indoors and the TV on. Richard Petty was fighting a losing streak. A slight rain delay brought up the anticipation level. Cale Yarborough had come back from a three-lap deficit to challenge Donnie Allison with an almost-certain winning slingshot pass on the last lap. The two crashed and Petty, Darrell Waltrip and A.J. Foyt came from a half of a lap back to have their own battle for the checkers. While Petty visited victory lane, Yarborough and the Allison brothers were having a fistfight on the turn three infield. Monday morning the nation was talking about the Daytona 500. 2. 2007. Upside down and over the finish line on fire. That is a motorsports cliché we all joke about for a dramatic ending. Clint Bowyer lived it on this night. Mark Martin paced the field coming under the white flag and looked like his zero-for-life score would end. Kevin Harvick had popped out of line in turn three from seventh position on lap 199. The outside lane formed by turn one on lap 200 and Harvick led that group with a burst of speed. Harvick edged ahead on turn three and Kyle Busch got loose in turn four triggering a pileup. Cars crashed, Bowyer rolled, and Harvick nosed out Martin for the win. 3. 1976. The two men who have the most Cup wins staged a dogfight at the finish. Richard Petty and David Pearson played the cat-and-mouse game of who would lead, and who would draft near the finish. Petty was in front as the last lap began and Pearson made the slingshot pass on the backstretch. Petty crossed back under Pearson in the east banking and moved back to first. "The King" moved up the track before clearing "The Silver Fox" and both machines spun and crashed off turn four. Petty’s blue and red Dodge stalled and couldn’t restart. Pearson kept his white and red Wood Brothers’ Ford running and was able to slowly creep across the finish line for his only 500 win. 4. 1998. “The most anticipated moment in the history of NASCAR racing – Dale Earnhardt rolling into victory lane in the Daytona 500,” was the call CBS anchor Mike Joy made following the long-awaited checkered flag. Earnhardt was victorious at Daytona many times in various races over the years. Dominant in some. But the 500 was elusive and he had come so close, so many times. Competing team members encompassing a few hundred people formed a receiving line on pit road to slap the Intimidator’s winning hand. 5. 1959. The First Annual 500-Mile NASCAR International Sweepstakes began what we now know as The Daytona 500. 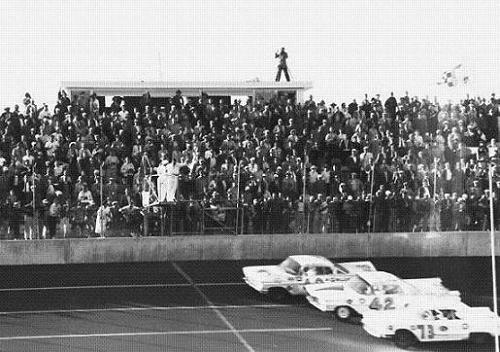 The brand new superspeedway opened to a crowd of about 44,000 fans. Everyone associated with the event from competitors to organizers did not know what to expect. The steep banking allowed cars to be driven wide open for an entire lap. An aerodynamic phenomenon was discovered that is now commonly known as drafting. The 500 miles ran caution-free. Lee Petty and Johnny Beauchamp dueled door-to-door for the checkered flag. The pair crossed the finish line three wide with the lapped car of Joe Weatherly. Lacking modern technology to determine who actually won, Beauchamp went to victory lane and had the celebration. Debate and discussion grew and Bill France Sr. asked for anyone with film of the finish to send it to NASCAR. Petty was finally awarded the victory following 61 hours of review. THANK GOODNESS – IT’S BACK TO RACING TIME!